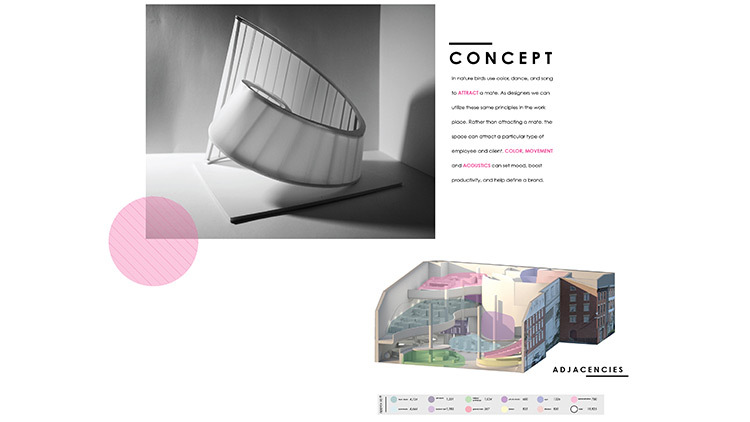 For this project, the design process began with a fetish object, which was used as a tool to identify a specific customer and aesthetic for the hotel. All of the inspiration, decisions and research would come from this object. Here, the San Sebastian glasses by Etnia served as the inspiration. The glasses’ influences of a mid-century modern, 1950’s brow line and horn rim update the style with an unexpected pop of playfulness. The name for the hotel, BOOM, was inspired by the synonymous phrase of the mid-century, Baby Boomers. The material palette and furniture choices were drawn from this fetish object with a mixture of woods, purple-lit elevator bays and signage, and brushed chrome and concrete to create a slick public space. A dynamic design for the lounge evokes a sense of awe and curiosity, while the lobby is challenges the usual aesthetics of a conventional hotel space.